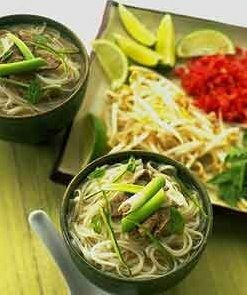 Vegetarian Pho Bo is menu for vegetarian food and most famous of Vietnam. It’s easy for cooking. That is good idea for Vegan. 1. Make the broth as directed. When broth has been simmering for about 10 minutes, soak the noodles as follows. Bring 4 quarts of water to boil in a large pot. Remove from heat, add noodles, and let soak around 15 minutes, stirring occasionally until noodles are pliable and easily separated. 2. Drain the noodles and divide them among six bowls. Simmer the seitan in the broth until heated through, about 4 minutes. Remove the seitan with a slotted spoon and slice thinly into six portions. Add to noodles. 3. Assemble the soup by placing the bean sprouts, cabbage, greens, basil, cilantro, scallions, and optional peanuts on top of the noodles and seitan. Ladle the hot broth onto the noodle mixture. I live right near Little Siagon so whenever i get a craving for this, I can just head on down the street. It's great!